June 2014 – Concurrent Technologies at International Supercomputing Conference, Leipzig. Concurrent Technologies has released an Advanced Mezzanine Card (AdvancedMC™) module featuring either a dual or quad-core 4th Generation Intel® Core™ processor combined with IDT’s Tsi721 PCIe to RapidIO®bridge to deliver a low latency and scalable compute element. 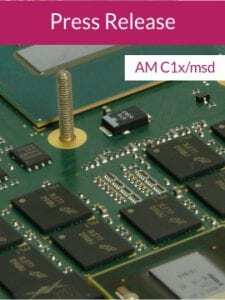 Compared to Concurrent Technologies’ previously released modules, the new AM C1x/msd offers improved CPU processing performance as well as incorporating two 10Gbit Ethernet interfaces on the front panel for additional high speed network links. Fabric Interconnect Networking Software (FIN-S) is supported allowing developers to create applications that transparently span clusters of AM C1x/msd AdvancedMC modules utilising the internal RapidIO® interconnect for low latency complemented with Ethernet links for ubiquitous connectivity. Typical applications for this type of solution include wireless test and infrastructure, Intelligence Surveillance and Reconnaissance (ISR), image recognition and database query from the telecoms, defence and other markets that need High Performance Embedded Computing (HPEC) equipment. Simultaneous with the module release, Concurrent Technologies is demonstrating a multi-core HPEC cluster system based on the open standards Data Centre Compute and Networking (DCCN) solution as a member of the RapidIO Trade Association. This system has a CPU processing capability of 268.8 GFlops within a 1U enclosure suitable for fitment in an Open Compute Platform (OCP) 21” shelf. Four Concurrent Technologies AdvancedMC modules are fitted, mated with SATA3 based Solid State Drives (SSDs) for high performance and low power consumption. Concurrent Technologies is demonstrating the system running a Hadoop cluster of 16 cores and 64GB of DDR3-1600 memory with a measured bandwidth of 1800MB/s. The cluster uses Concurrent Technologies FIN-S middleware to emulate Ethernet links over the underlying RapidIO fabric, which means that application development is seamless and the connection between the modules is more deterministic and with lower latency. In addition the solution has 4 QSFP RapidIO uplink connections making it ideal as an adjunct box for existing low latency applications.